You might be wondering, “What is the Cyborg R.A.T. 7?” It’s a USB mouse. Correction: A high-end USB mouse featuring a 6400 dpi laser system for precise control. The construction uses black matte plastic built around a metal base giving the mouse a solid, durable feeling of quality. Not only is its design unique, it is also well-built and highly sensitive. Cyborg R.A.T. 7: The best mouse I have ever used. After more than a year of usage, the R.A.T. 7 continues to perform brilliantly. Worth every penny. The R.A.T. 7 is also customizable by adjusting its weights, grips, finger rests, and tracking dpi. Parts can be switched around to give it a different appearance. This is truly a mouse-tinkerer’s dream. Even though the R.A.T. 7 is advertised for the PC and Mac, it is fully compatible with Ubuntu without needing to install drivers. Just plug and play. However, there is an issue with Ubuntu 10.10 where the mouse buttons become unresponsive a few moments after powering up the computer. The cursor still moves, but the buttons quit working. One way to resolve this is by restarting X (Left Alt + PrtScrn + k or Ctrl + Alt + Backspace, depending upon your configuration), but this must be performed each time the mouse acts up. Is there a better way to make Ubuntu recognize the mouse? This eliminates the need to restart X and makes the mouse completely usable every time Ubuntu starts. Just modify xorg.conf with the section above and the R.A.T. 7 functions perfectly. Say goodbye to restarting X.
the Mad Catz might use something else (not tested). Product strings much match to avoid the button freeze issue. Ubuntu recognizes mouse buttons by their numbers, so you will need to know the button numbers in case you want to map buttons to specific functions, such as rotating the desktop cube. Cyborg R.A.T. 7 button numbers as seen by Ubuntu. At this time, the small red button and thumbwheel cannot be mapped, so they are unused. This has never been a problem for me since I never use them. This rotates the cube (switches viewports) when the cursor is over the desktop and the mouse wheel is scrolled or clicked. This is to avoid rotating the cube when the cursor is inside a window and you want to scroll the contents. This rotates the cube no matter where the cursor may be located. Very useful. The desktop cube must be enabled. When moved on a dark surface, the R.A.T. 7 works, but if it is lifted, respositioned, and set back down, it takes about half a second for the mouse to become responsive again. This can become annoying. However, light-colored surfaces do not produce this effect, so use a white or other light-colored mouse pad for the R.A.T. 7. There you have it! A working Cyborg R.A.T. 7 in Ubuntu without any need to install drivers. Have fun! This entry was posted on March 7, 2012, 4:41 PM and is filed under linux. You can follow any responses to this entry through RSS 2.0. You can leave a response, or trackback from your own site. Apparently buttons 6 and 7 are side scroll on a Logitech mouse so I remapped 10 and 11 to those buttons, 10 and 11 being the thumbwheel. Button 12 is the snipe button; I haven’t found a use for it yet but leaving it enabled is no problem. 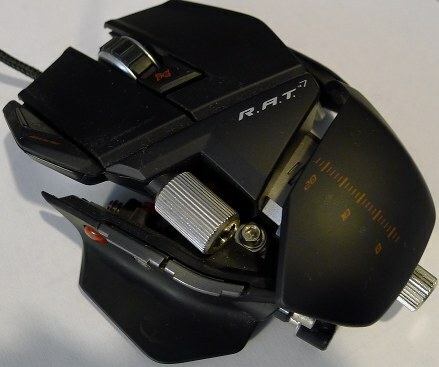 Apparently there are no buttons 6 and 7 on the RAT out of the box. I think the whole reason that you have to use this code in the first place is to disable the mode switching button (I guess that must be button 13, or more precisely, latching buttons 13-15? dunno, didn’t try it, although I suppose if I started xev and then plugged in the mouse with all buttons enabled I could capture that.) In any case the button mapping given above makes the RAT work the way that I want it to, which is all that really matters, right? Hey, thanks for the added information! The original ButtonMapping posted was discovered by trial and error, so there are no doubt some unnecessary button mappings. Thank you for clarifying the button numbers and improving the ButtonMapping line. That is a big help. Especially in the 9 7 6 12 part. It’s tricky stuff.